Summary: Another record annual performance from the property-trading specialist — although you would never know that from the sparse management narrative. Gross margins remain high, debt continues to be paid off while the share price still languishes well below my assessment of possible net asset value. I continue to hold. Bumper interims during November had already gone a long way to ensure these annual results would be another record performance. For the year as a whole, revenue gained 12%, operating profit advanced 15%, the dividend was lifted 9% while net assets climbed 8%. There should be much more detail of MTVW’s 2016 achievements within the forthcoming annual report. Nonetheless, the business did progress well compared to the H2 of the prior year. I was also encouraged by MTVW’s 66.5% gross margin, which surpassed the prior 66.2% peak of 2008. Clearly the firm is able to enjoy good sales prices on the historical cost of its properties. This was the third consecutive set of annual results to show more cash being used to repay borrowings than used to buy more properties for trading. Some £21m was spent to pay off loans versus £10m spent on new stock. On aggregate, for 2014, 2015 and 2016, the figures are £46m for repaying debt against £17m for acquiring new properties. I get the impression from this trend that MTVW is not being overwhelmed with bargain property opportunities at present. Still, I’d like to think MTVW will be sitting very pretty if the property market does in time produce some attractive buying valuations. This next table compares the value of MTVW’s trading properties to the group’s net debt. You can see net debt falling considerably and, representing the equivalent of 12% of the firm’s trading properties, is at its lowest relative level for at least 20 years. I reckon MTVW is capable of increasing its current net borrowing by at least £60m to £100m-plus — which would come in handy if the property market does flounder and cheap homes can be easily snapped up. These results showed trading investments of £334m which, if sold at the the average margin enjoyed during the last ten years, would yield about £869m. Tax the resultant gain at 20% and then add on other investments of £29m and subtract net debt of £41m, I arrive at a possible net asset value (NAV) of £749m or £192 a share. That compares to the £80 per share NAV reported by MTVW today on a historical-cost basis. With the share price at £103, clearly there is still some upside potential here. 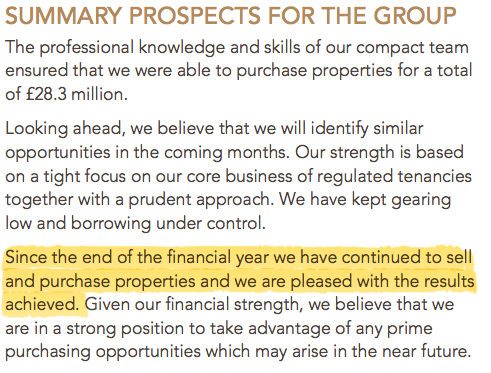 But the great unknown remains how long it will take MTVW to sell all of its existing properties to realise that potential £192 per share NAV guess. For a more immediate NAV estimate, there is the £666m figure assigned to MTVW’s trading stock by an independent revaluation as at September 2014. 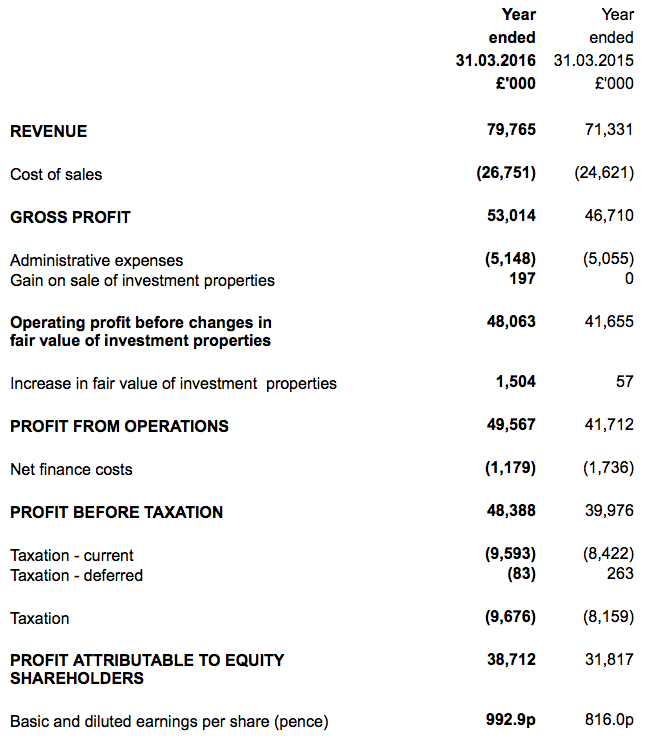 Adjusting this £666m valuation for tax, investment properties and debt, I come to an NAV of £150 a share. This £150 estimate is based on MTVW’s properties being in their current ‘regulated tenancy’ state — so does not include any upside potential for when the property is vacated and can be sold at market value. Nor does this £150 estimate include any house-price gains experienced since the September 2014 revaluation exercise. However, I calculate MTVW has sold trading properties worth £63m after the revaluation assessment took place, and has bought new stock worth only £16m. Some complex sums in a Comment below suggest to me an NAV of £140 per share. At least the 300p per share dividend provides a straightforward yield of 2.9% at £103. Here’s a rough explanation as to how I arrived at a £140 per share NAV guess. I’ve started with the £666m revaluation estimate of MTVW’s trading stock as at September 2014. At the time, MTVW’s trading stock had a book value of £318m — so the ‘revaluation multiplier’ for the average MTVW property is 2.1x. * £9,390k stock in H2 2016. 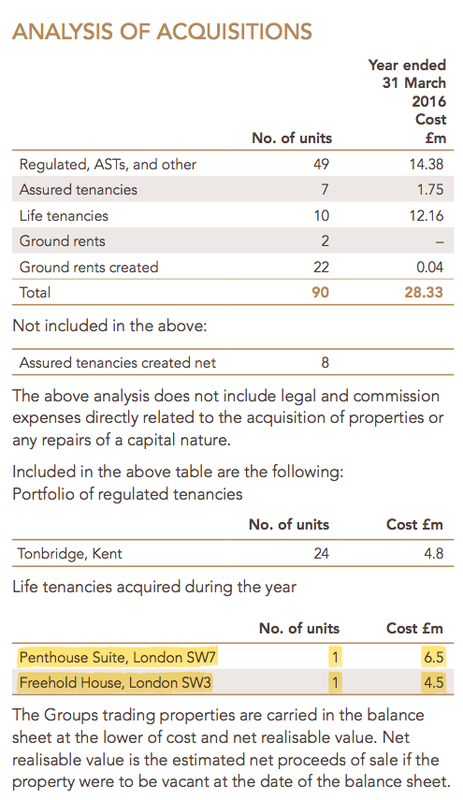 I’ve had to guess the H2 2016 £9,390k figure because MTVW has not separated its rental income from its property-sale income in these preliminary results. So I have assumed rental income and profit in H2 2016 was the same as in H1 2016, which gave me £27,892k of H2 property sales and £18,502k of H2 property gross profit = £9,390k stock sold. £9,055k plus £11,535k plus £9,390k = £29,980k. Using the ‘revaluation multiplier’ of 2.1x gives £62,845k, which represents the potential revaluation worth of the properties sold since the revaluation. So MTVW is left with £666m less £63m = £603m of revalued trading stock. The historical cost of this trading stock would be £318m (as per the September 2014 revaluation date) less £29,980k = £288m. Selling all the remaining £603m of revalued trading stock would give a gain of £315m (£603m less £288m historical cost) and a 20% tax liability of £63m (20% of £315m). 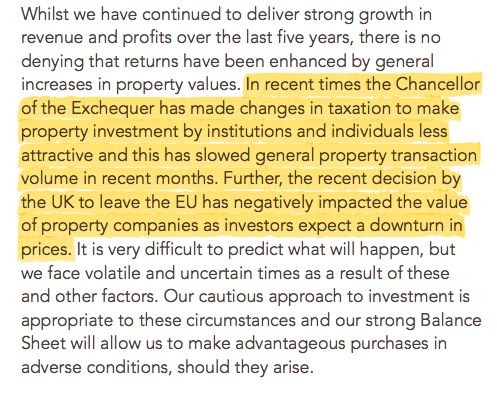 So… £603m less £63m tax, plus £29m of other property investments, less net debt of £41m gives £528m of possible NAV value. 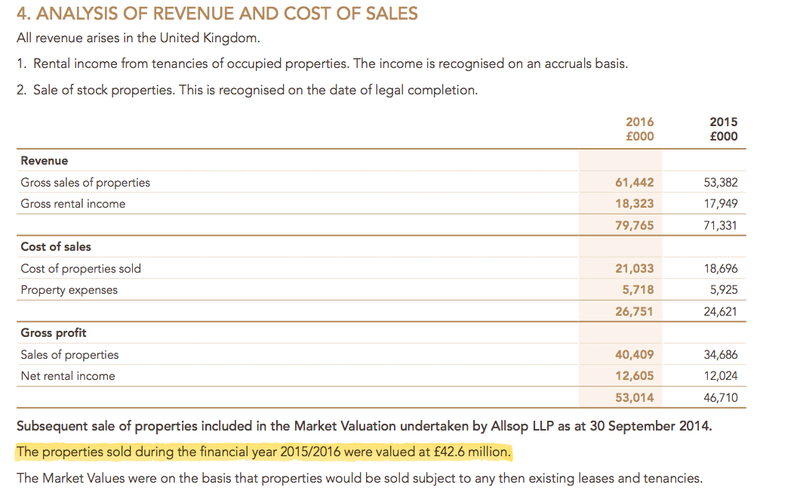 Plus £16m of stock purchased since the revaluation gives £544m, or £140/share. I hope this makes some sort of sense — and I am sure these calculations will become much more complex (and inaccurate) as time passes and the revaluation exercise becomes ever more distant. House-price gains enjoyed by the remaining trading stock will complicate matters further (I have ignored such gains for now). But it is worth considering that during recent years, MTVW has been selling a lot more property than it has been buying, and so the market value of its (remaining) trading stock may have shrunk since the £666m figure was announced. Studying the 2016 annual report (see Comment below) has revealed an error within my earlier valuation sums. Argh. The cash flow statement indicated a net £16m of new stock purchases, but what I forgot was £30m of stock had been sold that year, too. So total stock bought would have been £46m. 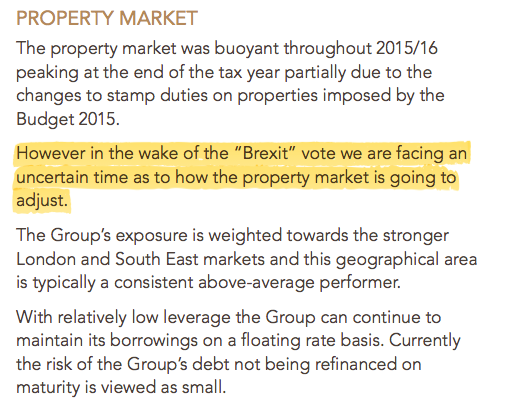 Assuming MTVW can eventually sell all of its revalued stock at the 44% premium seen during 2016 (see Comment below), then my sums point to a NAV of £204/share for a complete liquidation with all units sold without tenants. Thanks for the comment. You raise a good point. Not sure if MTVW would need some sort of shareholder/Panel on T&M approval for a further buyback, given the family concert party control 53%. But I’d say buybacks here would be sensible, at least value-wise. It would give more control to the concert party and make the share even more illiquid as you say. It’s odd that the market seems out of favour with MTVW despite the positive news? David, it might be general market sentiment towards property shares at present. Following the sparse narrative within the original results RNS, there is quite a bit to go through here. The 2015 annual report said inventory of £18.4m would be settled within 12 months, and in the event inventory of £21m was sold. Similar understatements occurred in 2012, 2013 and 2014, too. So there is hope that MTVW can sell more than £20.5m of stock during 2017. The average property sale price was £294k during 2016, which suggests the group’s properties are generally not ‘super-prime’ units that may be difficult to shift without a steep discount in a downturn. So, some chunky bonuses for the two execs. 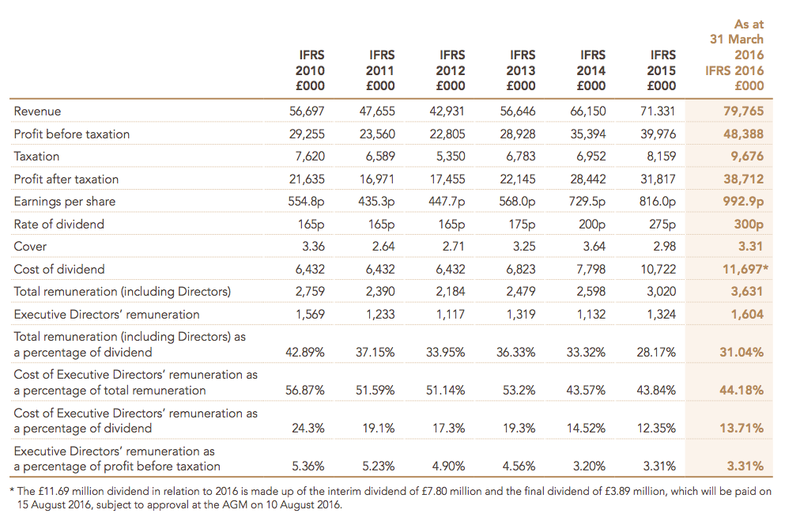 But as the annual report says, there is no option scheme in place (a good sign) and I reckon the boss has seen his total pay compound at 12.0% pa since his first full year in the top job in 1991. During the same 25 years, the dividend has compounded at 12.7% pa.
For the last five years, it’s boss pay up 12.5% pa versus the dividend up 12.7% pa. So I can’t really say the boss hasn’t earned his greater income. That 48% does seem a lot, although only 26 people are actually employed at MTVW. For 2016, the average revenue per head was an amazing £3m and the average employee cost was a hefty £139k. Exclude the executives and the average employee cost was almost £80k. Note, however, that such an uplift occurs only when MTVW sells the property — which itself is dependent on the tenant vacating the property (usually by dying). Going on the amount of stock sold during 2016 (£21m) and the carrying value of the property stock at the start of the year (£323m), the lifespan of a property on MTVW’s books could be said to be 15 years (£323m/£21m). The average cost per unit was £315k, which was bolstered by two sizeable purchases in London. The average cost last year was £226k and the year before was £133k. As such, the group may be having to place bigger bets in the current property market to replenish its stock portfolio — I shall have to keep watch on this. Certainly there are no bad debtor worries here. It appears 179,400 and 118,100 shares have been transferred from two family trusts to the actual beneficiaries of the trusts. The shares represent 7.6% of the company. As I understand matters, a notable part of the wider Sinclair family are unhappy with the way the Concert Party control the business (with its 53% aggregate stake). Certainly Graham Murphy, husband of 15.3% shareholder Mrs M Murphy (who is the sister of MTVW’s chief exec), is a dissident shareholder. I guess the Craig Murphy mentioned in the Notifications above could be a relation to Graham. Craig Murphy now holds 117,143 shares direct or 3% — a stake worth c£12m. Lucky chap.